One of my least favorite household chores is dusting. Here in the desert, if I let it go for longer than a week, I can trace my name in dust on the TV screen. After a month, geologists could easily do sediment dating there! If this sounds familiar, you've probably also noticed that when the light is just right, the dust appears totally invisible. But when the lighting changes —usually moments before company arrives for dinner — the room seems aglow with the stuff. Well, the same is true in our part of the solar system. Whoever's in charge is apparently no neater than I because the entire inner solar system is littered with a thick, dusty disk. And, while this interplanetary cloud is composed of different material than that blanketing the coffee table, the principles for seeing it are rather similar. Since this dusty disk lies mostly in the plane of our solar system — along the band of constellations we know as the zodiac — that's where it appears if the lighting is just right. And now is one of those times: During March and early April, this softly glowing pyramid of interplanetary dust ascends almost vertically from the western horizon at dusk. We call it the "zodiacal light." Stargazers who have never seen this phenomenon tend to expect a much smaller or brighter glow. It appears to ascend one-third or even halfway up in the western sky. Its base typically appears to be some 15 degrees wide, and the cone tapers to only about five degrees wide at the top. To see it, you'll need to head outdoors after sunset to a place where you'll have a clear view of the west and no glow from city lights in that direction. During twilight, let your eyes adjust to the darkness and then, about 90 minutes or so after sunset, begin looking for a tall, softly glowing pyramid rising from the western horizon and reaching its top near the tiny Pleiades star cluster high in the west. Remember this: If light pollution, haze or moonlight is present anywhere in the western sky, you'll have quite a challenge spotting it. This phenomenon was described nearly a millennium ago by the Persian poet Omar Khayyam in his famous book "The Rubaiyat." Today, we know that the zodiacal light is produced when sunlight reflects off scattered dust particles, most of which are continually generated by passing comets or by collisions among asteroids. Each particle is only about four hundredths of an inch across, and they are separated by an average distance of 5 miles. 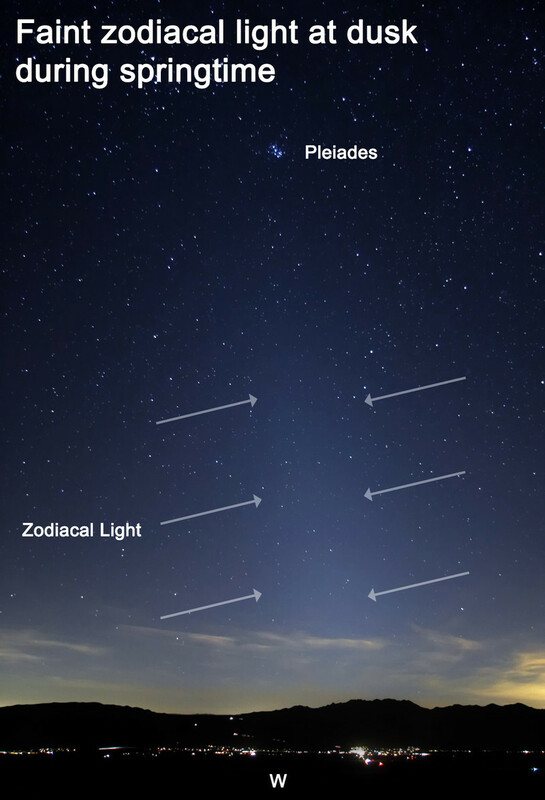 Because it appears brightest in the direction of the sun, we see the zodiacal light best when there's no moonlight and when the plane of our solar system (the ecliptic) forms a steep angle with the horizon. The best conditions occur after dusk for only a few weeks in March and before dawn in September. 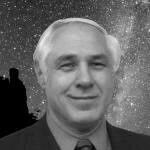 Most people don't even know this phenomenon exists, let alone that they can see it in a dark nighttime sky. So, take a drive to the country or the mountains this week, far from the lights of any cities, and search the skies for this elusive glow yourself. 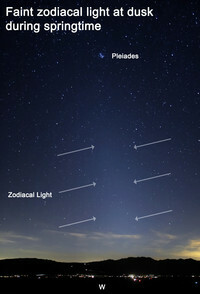 During the month of March, the zodiacal light can be seen best at dusk.